A few months ago, while browsing the glorious website that is Groupon, I found a deal for the Mt. Rainier Scenic Railroad and Museum. Our reservation was for Saturday morning and like any mother of a toddler, I didn't tell Camden about our big adventure until the day of. This was his face when I told him we were going to ride a real train. Just kidding. This was just a (hysterical) selfie he managed to take of himself during the car ride. It took about an hour and forty minutes to drive to Elbe, where the train depot was located. I think his little mind was blown once we parked and were standing face-to-face with a "big train, mommy!" My parents bought the Groupon too and came with us which made it even more fun. I cannot even explain how much Cam loves his Grammy and Papa. Seriously. I was even more glad they came because Ryan had planned to come with us but decided to stay home last minute so he could continue his crazy studying for his new job. We rode about 40 minutes on the train to the museum in Mineral, spent about 30 minutes there, and rode another 40 minutes back to the Elbe depot. Cam was pretty much in awe the entire time and would have stood in the caboose the entire ride if we had let him. It was a crummy, cloudy day so we didn't see Mt. Rainier, and to be honest - I was a little disappointed in the "scenic" portion of the whole thing, but to see the smile on this little train lover's face made the whole day incredibly worth while. He has only asked to "go big train, mommy?" about 100 times since. I'm here. We're alive, I promise. I've opened up my Mac many times in the last four weeks to pluck out something, but each time I end up shutting her down because my heart really isn't in it. I really hope I'll get back into the swing of posting, so fingers crossed. As every mother before me has stated, and I too say all the time - I cannot (repeat, cannot) believe how fast time is going and that Zoey Bear has already been stealing our hearts for one whole month. - At one month, I am guessing she weighs close to 10 pounds. Sister hasn't needed to see the doctor nearly as many times as her big brother did so I won't have an official weight status until two months. - Is a very calm and relaxed baby so far. - Has the same nose and lips as Camden, but has Ryan's and my dark hair, and my skin complexion. I see more of myself in her every day. - Has dark blue eyes and brown hair. The hair on the top of her little head is all falling out, leaving her with a fabulous mullet. - Showed some sensitivity to dairy so I've eliminated that from my diet. You should see the death glare I give Ryan when he pulls out the tortilla chips and sour cream for a post-dinner snack. - Goes from hungry to hangry real quick. This has proved interesting when trying to get her to take a bottle. If we reach hangry status, there's no way she's taking that sucker. - Is super uninterested in taking a pacifier but you can bet your booty I'm trying really hard to make her a believer. - Does not appreciate getting dressed. Getting undressed is tolerable. - Has the most intense hiccups I have ever seen/heard from a wee baby her size. It's no wonder her in-utero hiccups would make me feel nauseated. - We've been battling thrush for two and half weeks now, but that's another post entirely. Promise. - Sleeps anywhere from four to six hours overnight. This mommy much prefers the six. - Has no idea how much she's loved and adored by her big brother. We're working on being gentle but he has no idea what that means. My mom gave me a dress that I wore for my one month pictures and I tried to take pictures of Zoey in the same dress today, but I am no professional photographer and I desperately want a decent comparison photo - so we'll be taking a little trip to JCPenny's next week (thank you, Groupon!). I'll be sure to share. I won't leave without a comparison of Camden and Zoey at one month. I hadn't quite figured out my "monthly photo" strategy yet at Camden's one month birthday, but it's better than nothing. Until next time. 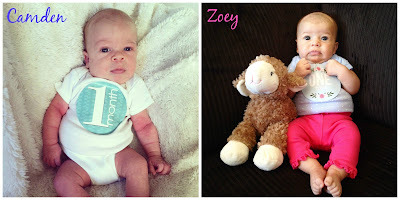 Which I hope is before Zoey's 2 month post on August 2nd.